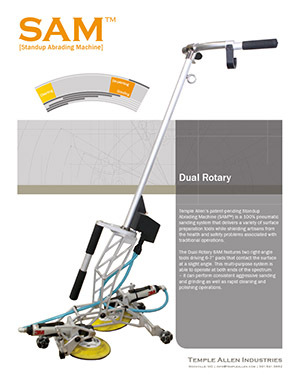 The Temple Allen SAM™ systems are 100% pneumatic and deliver a broad range of surface preparation tools while shielding artisans from the health and safety challenges associated with traditional operations. 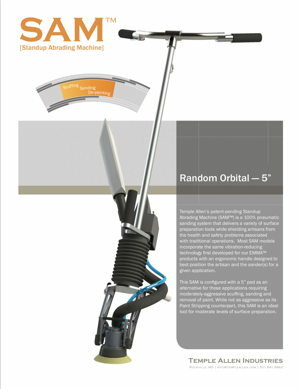 All systems are available with a fixed-length handle or with a telescopic handle. Click here for the SAM Family Brochure. 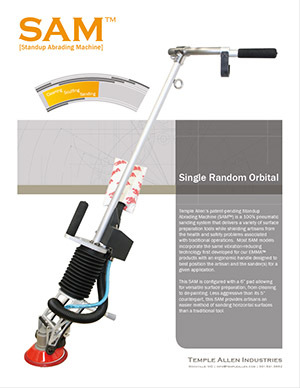 SAM™ Random Orbital - 5"
All SAM systems* incorporate the same vibration-reducing technology first developed for our EMMA™ products positioned in-line with an ergonomic handle designed to best position the artisan and the End-Effector for a given application. 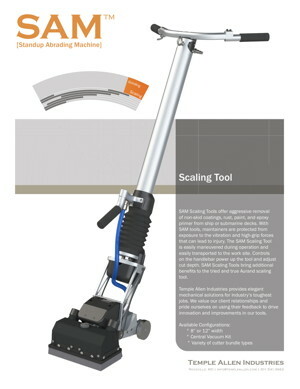 The SAM offers an ergonomic alternative for abrading the tops of aircraft wings, the decks of ships or oil platforms, wind turbine blade molds, and any other large horizontal surface that currently requires artisans to position a tool on the ground, typically by working on their hands and knees. 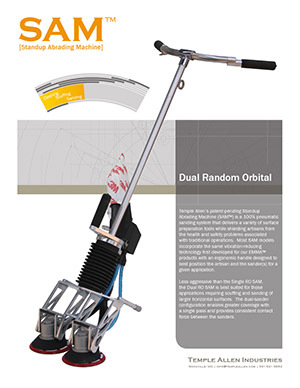 In addition to protecting them from the vibration typical of the hand tools used in the industry, the SAM also prevents the knee and back injuries associated with these awkward positions. 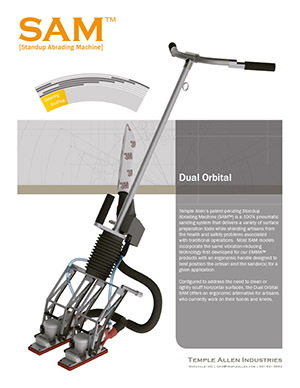 SAM also incorporates the new Integrated Dust Collection System developed for EMMA™. The system feeds supplied air through a venturi which generates vacuum suction at the End-Effector. The dust can be exhausted into a facility vacuum hose or, if preferred, into a 3M™ Clean Sanding Filter Bag, which is easily changed out when needed. This option prevents the user from having to manage a vacuum hose connected at a distance to an external vacuum source. 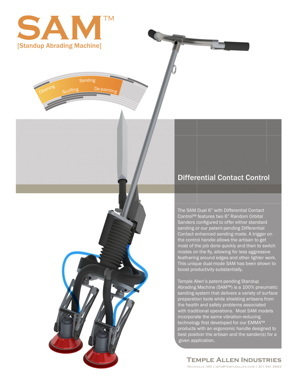 As with all Temple Allen Dust Collection Systems, the vacuum is automatically engaged whenever the tool is turned on. The video below is a compilation of clips showing some of our SAM tools.